The Slovak National Museum is the largest and most significant collection creating institution in Slovakia documents the development of nature and society, its history and culture from ancient times up to the present. The museum also documents the fate of Slovaks abroad and the history and culture of national and ethnic minorities in Slovakia. 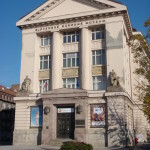 In the course of more than 110 years of its existence, the Slovak National Museum, whose historical core originated in the centre of the national efforts of the Slovaks in the past century in Turčiansky Svätý Martin, underwent a difficult formation process and also numerous organisational changes. Today this vast national institution administers a collection of more than three and a half million items, documenting especially developments in nature and society in Slovakia, the culture and life of Slovaks at home and abroad and changes in the life of the country and its population from the times of the forming of the geological layers up to the present, characterised by the building of a modern democratic state at the end of the second millennium. The museum, whose seat has been located in Bratislava since 1961, carries out its collection, documentation, scientific, education and the presenting work through a network of 18 specialised museums, in which professionals from numerous scientific fields work. It carries out co-ordination, expert counselling and methodological activities, administers archives of special significance and a scientific library with over 100,000 items and implements extensive publishing activities through the units of the National Museum Centre, which is also the centre for training activities in the field of museology and museographic disciplines. The museum administers extensive areas and many buildings of cultural monuments, including seven National Cultural Monuments. The Slovak National Museum is the largest user of cultural monuments in the Slovak Republic. The permanent expositions of the Slovak National Museum in Bratislava, Martin, Bojnice, Myjava, Betliar, Krásna Hôrka, Červený Kameň and other sites, tens of exhibition events implemented annually at home and abroad, the two magazines Pamiatky a múzeá – revue pre kultúrne dedičstvo (Monuments and Museums – Cultural Heritage Revue) and Múzeum (Museum) with their 50 year tradition, the oldest Slovak scientific anthologies and other non-periodical publications, catalogues, summary work and also counselling of amateur work with the general public comprise the permanent activities of this cultural institution, which is visited by more than 2.2 million visitors annually. The results of several of its scientific projects are recognised as fundamental to the economic, political and cultural history of Slovakia and the Slovaks, the development of Slovak statehood and the development and cultures of ethnic minorities living in Slovakia. The huge collections and significant real estate administered by the Slovak National Museum are of immense importance for national and state representation, for the civic and ethnic self-identification of the Slovak people. Despite the fact that the Slovak National Museum is one of the newest museums in Europe, its collections, the outcomes of its documentation and scientific work and the original documents and interpretations it presents are proof of its outstanding significance in the understanding of the country, its culture and population from the point of view of the geographical, political, economic and cultural development of the European continent.